The 2010 Norfolk Tides season was a mixed bag of sorts for the Baltimore Orioles’ Triple-A International League affiliate. In 2009 the Tides had a “Jeckyl and Hyde” quality. After an incredible April and May where they were playing close to .700 ball maybe of their young guns were prematurely called to Baltimore due to injuries of key players on the Major League Squad. The result was predictable those called up by the O’s were not fully ready and while some like outfielder Nolan Reimold did very well others did not fare so well, especially among the young pitchers. The young “baby O’s” did not have the benefit of good leadership in the dugout from Manager Dave Trembley and were exposed to a clubhouse that was used to losing, season after season. Meanwhile the Tides without the players who had given the team its early success went into a tailspin, as was the case with Tides players being called to the big league club too early the Tides found themselves restocked with promising but not quite ready Single and Double-A players. In addition to that injuries to other key players crippled the team. The Tides finished the season with a .500 record but just barely having to win their final game of the season the accomplish that. 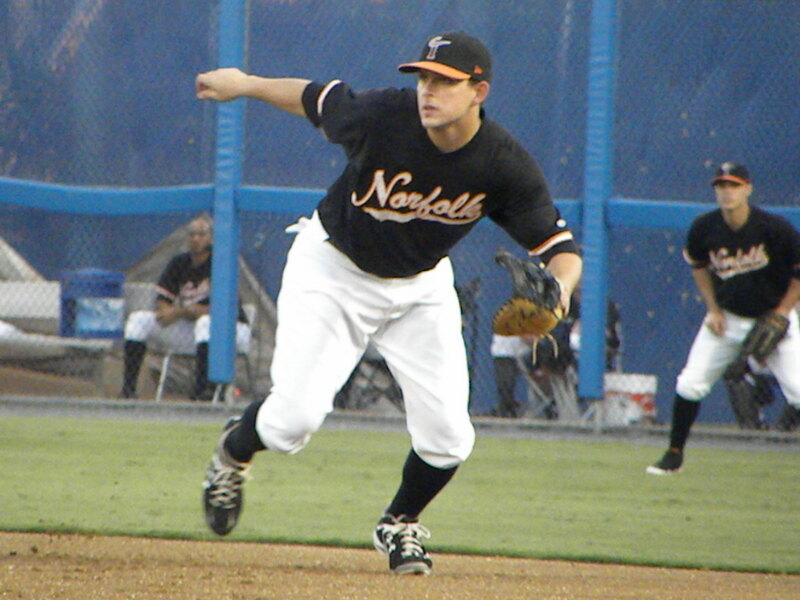 The 2010 campaign began with a team that looked pretty good on paper; until very early in the season the O’s called up some of the Tides best players which was compounded by the usual spike of injuries as well as the unexpectedly poor performance of some players that had been stars on the 2009 team. In May the Tides received a new Manager, Bobby Dickerson when Gary Allenson was called up to Baltimore as the Interim Third Base Coach when Dave Trembley was fired. Under Dickerson the Tides played a more aggressive style of baseball but were not consistent. They finished the season tied with the Charlotte Knights each with a record of 67 wins and 77 loses and a .465 winning percentage. Both teams ended the season 21.5 games behind the league leading Durham Bulls. A lot of the problem this year was in the hitting department. The Tides hit for only a .251 team average and with the exception of the home run category were near the bottom of the IL in every major offensive category. Now the hitting did improve as the season went on, in May the Tides team average was in the low .230s, they finished at .251. In one area they significantly improved from 2009 and that was in Home Runs. In 2010 the Tides had 122 well above the 78 of 2009. In the pitching department the Tides look solid until Jake Arietta and Alfredo Simon were called to Baltimore while other pitchers had rocky starts to the season or lost games because of either having no run support or being victimized by defensive letdowns in critical situations. In defense of the pitchers it must be noted that 80 of the runs scored against the Tides were unearned runs coming off of errors by the defense. Only one other team in the league allowed more than the Tides, their IL South rivals the Charlotte Knights. I saw many of these games where a pitcher would have the lead, have two outs in an inning and have a defensive error allow runs to score and get more batters to the plate. It happened time and time again. The team had 147 errors which averages more than one error per game with Shortstop Robert Andino having 31 of those errors leading the league in that category. It is my view that lack of fundamentals on the defensive side of the house and lack of hitting were the cause of most of the Tides misfortunes this year. While they may not have matched Durham they most certainly would have had a much better record, possibly one good enough to compete for the Wild Card spot in the playoffs. With a significant amount of moves coming up in the Orioles organization in the off season it will be interesting to see the changes on the Tides roster and possibly coaching staff. There were a lot of positives during the season among the individual players that cannot be overlooked. I will cover the players in part two of this series over the coming days and weeks.